In a recent speech, Jennifer Keesmat, Toronto's rock-star chief planner, said that when Toronto residents were surveyed recently about their willingness to commute by bike there was one surprising result. Among people who described themselves as avid recreational cyclists, who presumably knew how to handle themselves on two wheels, the most common response to whether they would commute by bike was some variation of "Are you crazy? I'd get killed!" With these words ringing in my ears, I set off to visit some places that make Hamilton great by bike one recent Saturday. I should note, I am a self-described nervous cyclist. A Monday to Friday transit user and every day pedestrian, I have never made much use of the various bikes around my house. I have a good helmet and a good lock (if not a great bike), but it's just not a mode of transport that it occurs to me to use regularly. This has always bothered me a bit and on a beautiful Saturday afternoon miraculously free of commitments, I set off from my home on Locke Street. I was determined to make the effort and excited to make use of the new Hunter Street bike lanes. My plans were straightforward: visit the AGH for their 100th anniversary exhibit and say hi to Dave at Mixed Media. First challenge: Getting from Locke to the Hunter Street bike lanes without a) feeling terrified, or b) breaking the law. With Hunter being narrow and one way westbound, I needed an alternate route to the bike lanes, so I made my way to Bold and headed east. I realized the error of my decision after a few minutes. Bold reaches Queen a full block south of Hunter and to get to the bike lanes I'd either have to head up another block on Bold, or ride against traffic for a block on Queen, which would be tantamount to suicide. I would have been better off to have chosen Canada Street, and taken my chances going south on Queen to connect to the bike lanes. The complexity of route planning was not easing any of my concerns about getting to the AGH in one piece. So after arriving at Bold and Queen, I walked my bike on the sidewalk one block north to the bike lanes and set out. I felt fairly safe on the route going eastbound, separated from the cars by another bike lane. However, the state of disrepair of what was formerly the curb lane was bad enough to nearly wrench my handlebars out of my hands on more than one occasion. Frustrated, I stopped and snapped a photo before proceeding through the sliver of the remaining (oncoming) bike lane to make my way around them. I made it onto Bay, where I proceeded through the city hall plaza to the AGH. At the gallery there was, astonishingly, only one bike rack for a block in either direction. A note to the AGH: If you make it easier for bike-riding-art-loving-hippies to visit your gallery, they likely will. Bike locked, helmet affixed to bag, I went and enjoyed a glorious hour in the free 100th anniversary exhibition. If you get a chance, go! Emily Carr, Tom Thomson, Alex Colville, and a couple of amazing mixed media installations (the Bruegel-Bosch Bus had me transfixed for twenty minutes) it's a selection of incredible art right here in your city. From there, I proceeded on to James North. Going back to Main to ride along that street would have been dangerous at best. Heading back to Bay to get to Wilson would have involved going quite a ways in the wrong direction. Riding against traffic on King to get to James never even entered my mind. So I walked my bike up along King, and rode down James. After a quick chat with Dave at Mixed Media, I decided I would look for something at Jamesville Hardware just south of Barton, and my trip was complete. Now I had to make it home. Riding up James towards Hunter, I was pleasantly surprised. Drivers were polite, kept a respectful distance and tolerated my obvious uncertainty. It was an unexpectedly enjoyable ride. Then I got to Hunter. The bike lanes on Hunter, of course, don't start at James. There is still a block long stretch of three-lane freeway to get past. So after walking to McNab, I started riding up the hill in the Westbound bike lane that is right beside the traffic. At the top of the hill, a pickup truck doing far more than the posted 40 km/hr cut across the bike lane where it curves around Park Street. I wasn't close enough for it to be an issue, but the lack of respect for the space in the absence of physical separation was clear. I made it over the crest of the hill, and proceeded towards Queen. Drivers here, in contrast to James North, whipped past at whatever speed they were accustomed to travelling. Despite the presence of the bike lanes, the culture of Hunter as a timed-light mini-expressway made me feel a lot more nervous than I had in the mixed traffic on James. I finished my journey down the bike-lane-free section of Hunter, because true to Hamilton form, the bike lanes end at Queen with no signage or logical connection to any other west-bound route. My conclusion from all this is that for a casual cyclist to make a short journey by bike in this city, you need a level of preparation, route planning savvy and confidence that creates a huge barrier to the introductory rider. Cities are all about choices. If you've ever spent time in a rural setting, you know the limits of living in a small town: limits to shopping, entertainment, travel, education and even employment. A huge part of what cities do is give you a choice, about where you get to shop, work and go to school, but also about how you get to travel. If you make some of those choices dangerous, or hugely inconvenient, then they're not really choices at all, are they? When it was launched, the Shifting Gears cycling plan was hailed as pretty much the best Hamilton was going to get in terms of cycling infrastructure. Clearly though, it's not even acceptable as a baseline. Hamilton, we need to do better. Well said Jason. It stuns me to see the number of cyclists increasing in the city, despite it being a horribly hostile city to ride in. If we simply developed a city-wide network of protected bike lanes, cycling rates would skyrocket. Main Street was down to 3 lanes all day a couple of times this week near Bay and brace yourself for this breaking news: It was still a freeway. Due to the loss of NE industry in this town, we are sitting on a glorious opportunity to add protected two-way bike lanes the entire length of Main. What other city can do that without even harming car traffic through the very heart of the city? We can also do this on Wilson, York, Wellington, Victoria, Claremont Access, Garth, Fennell, Rymal, Upper Kenilworth, Wentworth, Sanford, Bay, Birch, Burlington St and Queen. Again, without harming traffic flow. Most cities trying to add that level of connected, separated bike lanes would incur major traffic tie-ups and slow-downs, yet many of our competing cities are doing it anyhow because they understand the need for safe travel and they understand the future of cities. Here, we have an abundance of road lanes that aren't needed yet we cater to whiny suburban councillors who lie to the public about the need for all these mega one-way freeways. Interestingly, all of their suburban communities have beautiful, safe complete streets. In Toronto a debate is percolating over whether to convert King and Queen to one-way streets so they can add dedicated LRT lanes and bike lanes. In Montreal, their wide one-ways (like Hamilton) have allowed them to become North America's #1 cycling city by adding protected two-way lanes on many of those one-way streets. In Portland the cycling community was actively asking to have a couple of two-way streets converted to one-way so there would be enough road space for protected two-way bike lanes. With our rail trails, waterfront trails and nature trails both in the east and west sides of the city, we have the potential to connect literally every city resident to nature bike trails within a few minutes of their homes by simply offering this protected network of lanes and adding some mid-neighbourhood greenway routes. That our cycling committee has become one of the biggest obstacles to improving cycling in Hamilton (latest example is Hunter St) and are clinging to Shifting Gears as if it's worth clinging too shows how big of an uphill battle it will be to see a good cycling culture form in Hamilton. My shopping list of "low-ish-hanging-fruit". None of this stuff would be politically easy, but none of it is pie-in-the-sky fantasyland either. 1) Connect YesWeCannon with some bike-friendly means to go South after passing Jackson Square. 2) Give the normal local-road mixed-traffic "bike-routes" some loving. Identify all-way-stops for "Yield-to-cyclists" signs on a case-by-case basis. Any recommended "bike routes" are a must-convert, and unconvertable or regular stops on bike-lanes should be considered for converting into a traffic signal. Napier is my example here. This is actually good for drivers because it encourages cyclists to use the identified bike routes instead of biking in their way on King. Better bike route signage would be nice too - saying "bike path goes thataway" means nothing if it doesn't tell me where it's headed like a highway sign, since bike-routes aren't really "streets" when they jump around so much. 3) Convert various minor arterials and local streets to two way wherever width permits. The ones nobody will cry "war on cars" about, like doing the rest of Caroline. Nobody gives a crap if Caroline is 2-way or not, except it would make biking (and walking) on such streets less terrifying. 4) Take the little strip of double-wide-unprotected-bike-lane on Victoria north of Barton and extend it down to the Clairmont. Give every north-south 4-lane 1-way street this treatment. All the stuff I've identified above would make a huge improvement to cycling in the lower-city, and it mostly would involve paint and signs and putting up a couple of traffic-lights on one-way intersections to make them two-way. 5) Main street gets the Yes We Cannon treatment. 6) South half of the Clairmont Access becomes a pedestrian/cyclist promenade, and a yellow line is painted onto the north side. Rejiggering the intersections is the only expensive part. 7) Properly protect those north/south bike lanes I mentioned in (4). 8) Because I live in Westdale, a proper freaking paved path across Churchill Park, goddamn it. None of the stuff I mentioned above is massive moon-shot Earthshattering changes. It's not LRT. It's not converting Main and Cannon to two-way. It's not a pedestrian-only James Street. It's paint and knock-down-sticks and jersey barriers and reclaiming a little bit of overbuilt roadway. excellent stuff. You are right on all counts. And correct to point out that NONE of this is earth-shattering or hugely controversial. Yet the impact would be massive. I honestly think Bay St is ready right now for a row of planters on it's east lane for a two-way bike lane from Bold St to Barton. Or to keep it even simpler as you've suggested, just knockdown sticks and some portable curbs. The eastern lane is simply not needed. Heck, it's painted off as a dead zone from Main to King. And this isn't a massive arterial in LA - we don't need TWO turning lanes at every intersection. One works just fine thx. Also right about Churchill Park. So annoying. That's the worst part of my ride if I choose to head north to Cootes Paradise. Either go all the way around the school, or bump all over the place cutting through the park. Main getting the Yes We Cannon treatment isn't as controversial as one might think. First off, I would suggest we protect the lane with street parking which cuts down on the cost for lots of planters etc. This week Main was down to 3 live lanes near Bay for 2 days. Still a freeway. Turn the north lane into 2-way bike lane, paint a few foot buffer then add street parking to protect it. Viola. 3 live lanes remain and our most horrendous street is humanized a great deal and made safer for all transport modes with some paint and knockdown sticks. 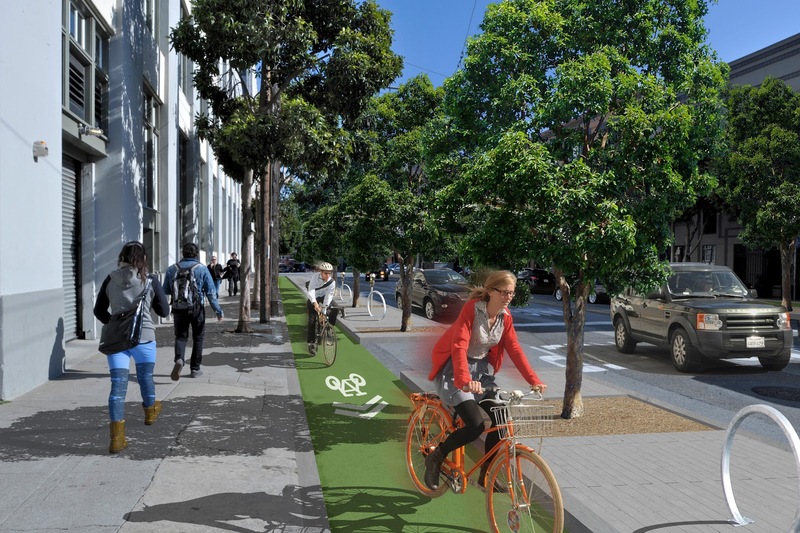 To really have an impact, plant street trees in new corner bumpouts in the parking lane and along suitable spots on both sidewalks, north and south, to green the street and make it a welcoming entrance and public space near city hall-AGH instead of a dead freeway. Thanks for sharing this Jason. Completely agree that the infrastructure and built environment do not support safety for all modes of travel and really exclude some from utilizing other modes of transportation. It's incredibly frustrating to see public health and safety in road and community design so undervalued in many ways. If you build a road that looks and feels like a highway, people will treat it that way, even if bikes are supposed to use that route too. Here's hoping the dialogue continues to shift and we see some action taken moving forward to build safe streets for all forms of transportation; and here's hoping nobody else gets hurt on the road before that happens. Thanks, again for writing this Jason! I love riding my one speed Schwinn but since moving to Hamilton from Guelph--a bike riding city for sure--I haven't dared. Yes, bike riders in Hamilton understand the challenges of navigating city streets alongside their 4+ wheeled counterparts. So why have City Council, City planners, and City workers been less-than understanding? Motivation. Where's the motivation to shift from a car-centric ideology to that of a more 'human scale' philosophy? Human scaled cities start with the citizen first, as pedestrians, as cyclists, as public transit riders, and finally car drivers. Being new to this city's politics, I"m at a loss to understand. I'd like to join the SoBi system but the prospect of cycling from Gage Park to Hamilton Beach (which is what I'd like to do) is terrifying, so I haven't taken out a membership. So many missed opportunities, Hamilton, by not being bike rider friendly. In Guelph I could spend an entire on my Schwinn, shopping at markets, stopping for coffee and treats, riding through parks, and taking in the art/culture the city offered. Hamilton as a city is hostile to cycling. Today, riding in from Burlington along York St., I encountered construction with a sign indicating the bike lane is closed and to use the opposite lanes. The ones going in the opposite direction. The ones that taper and end into oncoming traffic. Then ride on the sidewalk? Once through the construction, cyclists are left to their own devices to get back across York in an area with freeway ramps. It is as though Hamilton is telling me in so many large and little ways that it doesn't want cyclists outside of the evening cyclist on a multi-use trail just going for a little toot. The construction on York is why I have not come into town for the Farmer's Market this summer. York, on the Hamilton side of the 403, is hostile and unwelcoming. I've had my fill of that route. Although, I did have to visit the east end yesterday, and came in through Beach / Woodward. Love the bike lane on Woodward. Progress is slow, it's imperfect, it's dangerous, but I did my tour of duty cycling 10 years full time in Hamilton. Much better now than 5, 10 years ago. Keep improving! The bike share should put some pressure to continue improving! Please let's report people parked on bike lanes to the police, or at least file a complaint with the city. It needs to stop, especially because of the contra-flow. If a cyclist stood stopped in a lane of live traffic, it'd be seconds before angry horns were honking. From the number of comments and photos mentioning cars on the bike lanes, it looks like if a city officer hung out on Hunter for a bit, they'd earn their pay for the day. Take a photo and tweet it to Hamont City Police?City bylaw? Documents time license and pressures drivers to do the right thing one would hope. At a campaign event last night, a guest described being told by a neighbour "This city was built for cars. It will never work for bicycles." Point of fact - Ward 1 (if not the rest of Hamilton) was built for horse-drawn carriages and trams, and pedestrians. We adapted before, we can adapt again. Further to that point, in some densely populated cities the meteoric rise in popularity of the bicycle in the late 19th century was met with alarm and distress because of the way this new mode of transport disrupted horse-based transport. Cyclists were depicted as a menace to civilised society. I'm voting for you, Jason, and encouraging others to, as well. Thank you, Jason, for an excellent article. Your description of yourself as a "nervous cyclist" puts you in the majority. This majority is the 60% of the population that are interested but concerned when it comes to cycling. The link describes an excellent model, that has been validated by surveys in many, many places. Described in a Hamilton context, the entire population can be broken down into four types of cyclists. 1% of the population is "Strong and Fearless." They will cycle for everyday transportation even in the face of a lack of cycle infrastructure. 7% of the population is "Enthused and Confident." They will cycle for transportation on the sort of crappy, sub-standard cycle infrastructure that is currently being deployed in Hamilton. 60% of the population is "Interested but Concerned." They will cycle for transportation only on a dense, fine-grained network of safe Dutch standard cycle infrastructure. 32% of the population are currently non-cyclists "No way, no how." They will cycle for transportation only on safe Dutch standard cycle infrastructure AND cycling must be significantly faster, easier and more convenient than alternate modes of transportation. The proof of a good model is that it accurately predicts the future. What this model predicts is that the current lack of infrastructure should correspond to a 1% cycling mode share. And it does. The model predicts that the crappy, sub-standard cycle infrastructure currently being deployed in Hamilton has the potential to raise this mode share to a not-so-whopping 8%. The preliminary feedback is that, yes, this crappy infra is enabling more cycling. No doubt lots of politicians and city staff will sprain their hands patting themselves on the back while saying things like "eight times as much cycling!" while conveniently ignoring the ugly truth that 92% of the population is still excluded. I am excited about our progress. I also find myself regularly dumbfounded and disappointed about how easily and quickly we could be a great place to get around in all modes, and yet somehow end up moving slower than many other places with many more barriers to their development. When I cross over the 403 bridge on Main headed eastbound each day, I often think how negligent and disconnected from actual experience our road design is; it typically crosses my mind right when the bike lane ends next to 5 or 6 lanes of wildly lane shifting traffic / highway off-ramps headed toward Dundurn. No one responsible for the design of our city and its roads has ever ridden that section. I just read in a Ward 1 email update from Brian McHattie's office that bike lanes are "coming soon" to Charlton and Herkimer. Progress marches on, but an effective design and implementation will need to be measured before being counted as that. Exciting possibilities! The only problem is that the proposed Charlton and Herkimer contain the same deadly dangerous design flaws as Dundurn that will make riding in the bike lane the most dangerous place on the entire street to ride a bicycle. Why? Because the proposal is to place the bike lane in the door zone of adjacent parked cars. Please see this article and its photographs that show how this lures innocent cyclists into a lethal trap. Charlton and Herkimer don't need bike lanes, they're local residential streets. They don't need a bike lane any more than my home street in Westdale does. They need general traffic calming and two-way conversion (width permitting) for the sake of everybody living there, not just cyclists. I never feel unsafe biking in local streets in Westdale even though there are no bike lanes. Why? Because the traffic is slow and respectful and 2-way. That's the same treatment Durand/Kirkendall needs, not bike lanes. I agree with you on this, Pxtl. I'm not the most confident cyclist and make it a policy not to EVER ride on Main Street at all. But I'm fairly comfortable riding on Charlton and Herkimer (besides the risk of "dooring"). I think two-way conversion would be a better over-all solution in this neighbourhood than bike lanes in the interest of traffic-calming. Charlton & Herkimer are magnets for cut-through drivers and the speeds are excessive along these roads. Along Charlton in the morning and along Herkimer in the evening. And then there are the out-of-towners who don't see the sense of these being one-way streets either. Recently I was riding east on Herkimer approaching Locke when I noticed a car approaching ME from the other side of the intersection driving westbound on Herkimer. Oh dear, I said. The driver realized his/her error and did a u-turn and drove east on Herkimer to Kent. This is not an unusual situation, except this wasn't the Labour Day weekend at student move-in time. These streets are far too wide to justify a continuation of one-way flow. Along with Queen, Herkimer and Charlton should be converted to two-way. I live on Park just south of Herkimer. Herkimer is a high-traffic-volume high-speed racetrack of cut-through "rat-running" car drivers. The Durand Neighbourhood Association has been trying to end the cut-through rat-running since the 1970's. The sort of security bollards that are routine in virtually every Dutch city to prevent cut-through car drivers. City staff have been consistently frustrating the will of the people, most recently by preventing such a proposal from even appearing on the Participatory Budget ballot. Our wonderful democracy: Where the city staff does not allow people to vote on items to improve their own neighbourhood. I would like to play the 50 bollard game in Hamilton. First step: Use bollards to end cut-through car driving in Durand residential neighbourhoods. Wow. Very cool, and simple. This video shows how we should be thinking about the future of urban Hamilton. Cars should no longer be allowed to just roar though the core. Divert them around and create grand public plazas and places for people, bikes, shops, patios and LRT to nicely co-exist. Look no further then Brian McHattie and Jason Farr for listening to a small group of cyclists and not doing their due diligence in regards to the placement of bike lanes in Hamilton. As he does with most issues Brian has once again divided communities by not managing situations in his ward, bikes vs cars this time. Dundurn bike lanes are dangerous and a false sense of security, what can I say about Hunter Street besides REALLY! I use the Dundurn lanes daily and have found them to be a big improvement over the nothing we had before. Still not great, but better. What would you like to see changed? I am the author of this article with exact details of what is wrong with the Dundurn bike lanes and what should be changed. I am a cyclist but I am not so sure bike belong on the same roads as cars without a barrier. I think barriers would also benefit drivers since they would not have to worry so much about hitting cyclists. We also need more dedicated bike paths, like the waterfront trail is along portions of it's route. It would be nice to phase out the heavy industry taking place along the waterfront and replace it with parks and a long, wide, paved bike path. If you look at the geography if the lower city, I think many places become accessible if we have one long continuous path. What do you think of the double-wide bike lanes the city has used on Victoria? That is, the city took a full car-width lane, then converted half of it into a bike lane and the other half into an unused buffer zone. I'm personally a fan even though it results in cars parking in the lane and it's not really protected, because it does give me a bit of a safe buffer space and it's better than nothing, and the City just has to put down paint - no extra cost to plow it or pour concrete or anything else. Just paint. That means that every ludicrously overbuilt 1-way in this city could easily get that treatment. And, of course, brave/illegal cyclists can ignore the 1-way sign and use it as contra-flow at their own peril since there's enough room for oncoming cyclist traffic. But I don't know what those guys do when they come to the intersection at Barton. I haven't been to that part of Hamilton in a while. I think double wide is better, but I don't know if it would stop cars from entering the bike lane while making right turns; as a driver I always worry about hitting a cyclist on a right turn. I think it should be made a two-way bike lane, and protected with knockdown sticks and curbs. Also, space for a couple foot painted buffer zone could be made by repainting the rest of Victoria/Wellington with one parking lane, then 2 car lanes. We don't need a full 10-foot wide parking lane on the opposite curb. well said. My first comment above highlights some grand opportunities for us to do exactly that. Main, Cannon and Burlington St are incredible east/west opportunities. I've been riding to work through the summer from Westdale to my job at Hamilton General Hospital, and it shocks me how little it would take to make my route pleasant once the Cannon lanes are in. King has bike lanes to Dundurn, so I take those and then go Head->Napier - there are a few rough crossings like the 403 ramp and Dundurn, but it's not bad. Napier is a bit of a slog though because of all the stop-signs, plus it's pretty steep but I don't expect the city to fix that. An Idaho-stop policy, even a localized "ward 1 only pilot program" thing would make this kind of route much faster. Then I get to the end of Napier and it's a matter of not whether I will break the law so much as which laws. Or I can take my life into my own hands and pull onto York before Bay (and this doesn't work on the return trip anyways). Instead I cut through the walkway next to the federal building and ride in the sidewalk/crosswalk until I get to the far corner of York/Bay at which point I can take the bike-lane. Then it's York until the bike lane ends at John (or was it James) and I take Wilson all the way to Ferguson. I look forward to the Cannon bi-directional lane fixing this leg of the trip, because it's a little dicey. Then it's a nice relaxing break as I take Ferguson's bone-shaking brick road up to Barton. I've been debating whether the parking lot or Barton traffic is better once I get there... the parking lot is increasingly inviting. Once Cannon is ready, extend the double-wide-bike-lane on way-north-end Victoria down to Cannon and put a similar one on Wellington and I'll be golden. Then figure out something at Bay or Caroline or Hess (I won't bike on Queen or Bay as-is because I don't want to die). Convert any of those to two-way or give me a bi-directional bike-lane on any of them and I'm good. Caroline already is two-way for a bit thanks to Vrancor(? ), just continue that (and put a bike-path through Sir John A's grounds - heck, the students would probably use it). Find me a connection from Cannon to Napier and I'll do this year-round. Heck, throw a couple of ramps up to the Jackson Square rooftop thing. I don't care, just do something to make this work. So yeah, the Cannon lanes will make the North half of the lower city almost manageable. The problem is the stupid tangled mess when I get to Bay Street. Your mention of Hess just reminded me of an idea I passed on, and of course it was soundly shot down, by the cycling committee. Hess St from King to Cannon does not need all those lanes. The eastern lane can become a two-way bike lane. This would seamlessly connect King with the Cannon/York lanes and assist in trips like yours greatly. There is literally almost no traffic on Hess north of King. I'd honestly rather see it just get converted 2-way north of King. It would be better for everybody that way, just cyclists like me. agreed, but that will take more than a decade and exhaust half of city council. Stop with the broken record. We get it, you don't like the city and hate city council. Or we could just convert King and Main into two way traffic, add a bike line east and west on either street or one west on king and one lane east on Main. This is easily done...and yes we have the room to do so. All this connecting side streets and avoiding the Main and King one way issues is ridiculous. Converting King and Main back to two way will solve many issues. I have two friends who own businesses on King. Both are closing soon due to the fact that the bus lane has made it harder to run a business, receive deliveries, provide parking. Many of the so called experts in this city enjoy belittling shop owners on King and Main acting as if they don't have proof of their loss of business. Just imagine if we had two way traffic on both streets, you would have several businesses to shop at, more employment, more sense of community, easy to use bike lanes that you don't have to feel like you are on a scavenger hunt for a safe street just to get to your destination.